These are small kusudamas: they were made with 7.5 square paper and after glued form a flower cube with sides of 6.5 cm. The centers of the flowers are a little outside the “cube” giving it a rounded form. 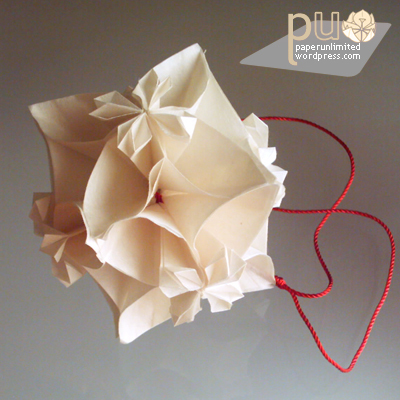 Each kusudama is made of 4 flowers with 4 petals each in a total of 24 petals. Overall, it’s a pretty kusudama with lots of variations! 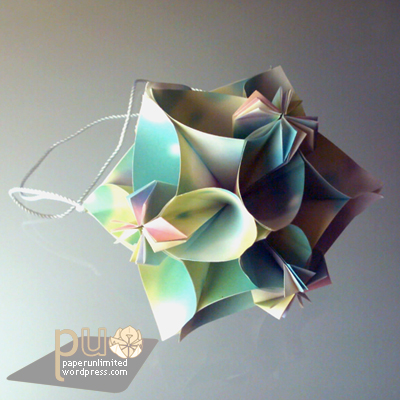 This entry was posted on 2007|02|28 at 10:57 and is filed under kusudama (glued), modular origami. You can follow any responses to this entry through the RSS 2.0 feed. You can leave a response, or trackback from your own site. nice kusudama. I would like to make it. could you please give some advice on how to glue the six flowers? I’ve tried it but i can’t manage to form it as a cube.